Portrait by Hans Holbein the Younger (1527). During part of the period covered by the long life of Cornaro there is one distinguished man, all reference to whose opinions - intimately though indirectly connected as they are with dietary reform - it would be improper to omit - Sir Thomas More. His eloquent denunciation of the grasping avarice and the ruinous policy which were rapidly converting the best part of the country into grazing lands, as well as his condemnation of the slaughter of the innocent life, commonly euphemised by the name of "sport," are as instructive and almost as necessary for the present age as for the beginning of the sixteenth century. Son of Sir John More, a judge of the King's Bench, he was brought up in the palace of the Cardinal Lord Chancellor Morton, an ecclesiastic who stands out in favourable contrast with the great majority of his order, and, indeed, of his contemporaries in general. In his twenty-first year he was returned to the House of Commons, where he distinguished himself by opposing a grant of a subsidy to the king (Henry VII.). In 1516 he published (in Latin) his world-famed Utopia - the most meritorious production in sociological literature since the days of Plutarch. In 1523 he was elected Speaker of the House of Commons, and again he displayed his courage and integrity in resisting an illegal and oppressive subsidy bill, by which he was not in the way to advance his interests with Henry VIII. and his principal minister, Wolsey. 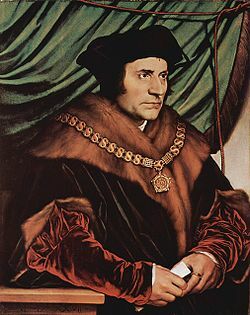 Seven years later, however, upon the disgrace of the latter personage, Sir Thomas More succeeded to the vacant Chancellorship, in which office he maintained his reputation for integrity and laborious diligence. When the amorous and despotic king had determined upon the momentous divorce from Catherine, he resigned the Seals rather than sanction that equivocal proceeding; and soon afterwards he was sent to the Tower for refusing the Oath of Supremacy. After the interval of a year he was brought to trial before the King's bench, and sentenced to the block (1535). In private life and in his domestic relations he exhibits a pleasing contrast to the ordinary harsh severity of his contemporaries. In learning and ability he occupies a foremost place in the annals of the period. Unfortunately for his reputation with after ages, as Lord Chancellor he seems to have forgotten the maxims of toleration (political and theological) of his earlier career, so well set forth in his Utopia; and he supplies a notable instance, not too rare, of retrogression with advancing years and dignities, and of "a head grown grey in vain." In fact, he belonged, ecclesiastically, to the school of conservative sceptics, of whom his intimate friend Erasmus was the most conspicuous representative, rather than to the party of practical reform. Yet, in spite of so lamentable a failure in practical philosophy, More may claim a high degree of merit both for his courage and for his sagacity in propounding views far in advance of his time. "Hunters also and hawkers (falconers), for what delight can there be, and not rather displeasure, in hearing the barking and howling of dogs? Or what greater pleasure is there to be felt, when a dog follows a hare, than when a dog follows a dog? For one thing is done by both - that is to say, running, if you have pleasure in that. But if the hope of slaughter, and the expectation of tearing the victim in pieces the pleases you, you should rather be moved with pity to see an innocent hare murdered of a dog - the weak by the strong, the fearful by the fierce, the innocent by the cruel and pitiless. (2) Therefore this exercise of hunting, as a thing unworthy to be used of free men, the Utopians have rejected to their butchers, to the which craft (as we said before) they appoint their bondmen. For they count hunting the lowest, the vilest, and most abject part of butchery; and the other parts of it more profitable and more honest, as which do bring much more commodity, in that they (the butchers) kill their victims from necessity, whereas the hunter seeks nothing but pleasure of the seely [simple, innocent] and woful animal's slaughter and murder. The which pleasure in beholding death they think doth rise in the wild beasts, either of a cruel affection of mind, or else by being changed, in continuance of time, into cruelty, by long use of so cruel a pleasure. These therefore, and all such like, which be innumerable, though the common sort of people doth take them for pleasures, yet they, seeing that there is no natural pleasantness in them, plainly determine them to have no affinity with true and right feeling." In telling us that his model people "permit not their free citizens to accustom themselves to the killing of 'beasts' through the use whereof they think clemency, gentlest affection of our nature, by little and little to decay and perish," (3) More for ever condemns the immortality of the Slaughter-House , whether he intended to do so in toto or no. In relegating the business of slaughter to their bondsmen (criminals who had been degraded from the rights of citizenship), the Utopians, we may observe, exhibit less of justice than of refinement. To devolve the trade of slaughter upon a pariah-class is not the least immoral of the necessary concomitants of the shambles. That the author of Utopia should feel an instinctive aversion from the coarseness and cruelty of the shambles is not surprising; that he should have failed to banish it entirely from his ideal commonwealth is less to be wondered at than to be lamented. That he had at least a latent consciousness of the indefensibility of slaughter for food appears sufficiently clear from his remark upon the Utopian religion that "they kill no living animal in sacrifice, nor do they think that God has delight in blood and slaughter. Who has given life to animals to the intent they should live." They sow corn only for bread. For their drink is either wine made of grapes, or else of apples or pears, or else it is clear water - and many times mead made of honey or liquorice sodden in water, for of that they have great store. because there be so few sellers," &c.
More points out very forcibly that to hang for theft is tantamount to offering a premium for murder. Two hundred and fifty years later Beccaria and other humanitarians vainly advanced similar objections to the criminal code of christian Europe. It is hardly necessary to remark that this Draconian bloodthirstiness of English criminal law remained to belie the name of "civilisation" so recently as fifty years ago. Erasmus (who, to lash satirically and more effectively the various follies and crimes of men places the genius of Folly itself in the pulpit) seems to have shared the feeling of his friend in regard to the character of "sport." "When they (the 'sportsmen') have run down their victims, what strange pleasure they have in cutting them up! Cows and sheep may be slaughtered by common butchers, but those animals that are killed in hunting must be mangled by none under a gentleman, who will fall down on his knees, and drawing out a slashing dagger (for a common knife is not good enough) after several ceremonies shall dissect all the joints as artistically as the best skilled anatomist, while all who stand around shall look very intently and seem to be mightily surprised with the novelty, though they have seen the same thing a hundred times before; and he that can but dip his finger and taste the blood shall think his own bettered by it. And yet the constant feeding on such diet does but assimilate them to the nature (?) of those animals they eat," &c. - Enconomium Moriœ, or Praise of Folly. If we recall to mind that three centuries and a half have passed away since More and Erasmus raised their voices against the sanguinary pursuits of hunting, and that it is still necessary to reiterate the denunciation, we shall justly deplore the slow progress of the human mind in all that constitutes true morality and refinement of feeling. Utopia. Translated into English by Ralph Richardson, Fellow of Corpus Christi College. London : 1556; reprinted by Edward Arber, 1869. We have used this English edition as more nearly representing the style of Sir Thomas More than a modern version. It is a curious fact that no edition of the Utopia was published in England during the author's lifetime - or, indeed, before that of Robinson in 1551. It was first printed at Louvain; and, after revision by the author, it was reprinted at Baale, under the auspices of Erasmus, still in the original Latin.